1: You Don’t Have to Be a Genius. 2: Think Process, Not Product. 3: Share Something Small Every Day. 4: Open Up Your Cabinet of Curiosities. 6: Teach What You Know. 7: Don’t Turn Into Human Spam. 8: Learn to Take a Punch. 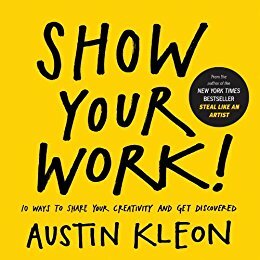 Interesting idea, he talks about the “ecology of talent.” Where people support, look at, copy and steal ideas. Sometimes, amateurs have more to teach us than experts. “It often happens that two schoolboys can solve difficulties in their work for one another better than the master can,” wrote C.S. Lewis. “The fellow-pupil can help more than the master because he knows less. The difficulty we want him to explain is one he has recently met. The expert met it so long ago he had forgotten. If all this sounds scary or like a lot of work, consider this: One day you’ll be dead. Most of us prefer to ignore this most basic fact of life, but thinking about our inevitable end has a way of putting everything into perspective. Reading about people who are dead now and did things with their lives makes me want to get up and do something decent with mine. Thinking about death every morning makes me want to live. Become a documentarian of what you do. Start a work journal: Write your thoughts down in a notebook, or speak them into an audio recorder. Keep a scrapbook. Take a lot of photographs of your work at different stages in your process. Shoot video of you working. This isn’t about making art, it’s about simply keeping track of what’s going on around you. Facebook asks you to indulge yourself by asking “How are you feeling?” Or “What’s on your mind?” Instead focus on answering the question: “What are you working on?”…Don’t show your lunch or your latte, show your work. More than 10 years ago, I staked my own little Internet claim and bought the domain name austinkleon.com. I was a complete amateur with no skills when I began building my website: It started off bare bones and ugly. Eventually, I figure out how to install a blog and that changed everything…One little blog post is nothing on its own, but publish a thousand blog posts over a decade, and it turns into your life’s work. My blog has been my sketchbook, my studio, my gallery, my storefront, and my salon. Absolutely everything good that has happened in my career can be traced back to my blog. My books, my art shows, my speaking gigs, some of my best friendships — they all exist because I have my own little piece of turf on the Internet. So, if you get one thing out of this book make it this: Go register a domain name. Buy www. [insert your name].com. * What sort of things do you fill your head with? * What do you read? * Do you subscribe to anything? * What sites do you visit online? * What music do you listen to? * What movies do you see? * Who’s done work you admire? * Do you have any heroes? * Who do you follow? If you want to be more effective when sharing yourself and your work, you need to become a better storyteller. You need to know what a good story is and how to tell one. This simple formula can be applied to almost any type of work project: There’s the initial problem, the work done to solve the problem, and the solution. We all like to think we’re more complex than a two-sentence explanation, but a two-sentence explanation is usually what the world wants from us. Keep it short and sweet. Strike all adjectives from your bio. My example: I’m a freelance copywriter. You Want Hearts, Not Eyeballs. Stop worrying about how many people follow you online and start worrying about the quality of people who follow you. The first step in evaluating feedback is sizing up who it came from. You want feedback from people who care about you and what you do. A troll is a person who isn’t interested in improving your work, only provoking you with hateful, aggressive, or upsetting talk. You will gain nothing by engaging with these people. Don’t feed them and they usually go away. Even if you don’t have anything to sell right now, you should always be collecting email addresses from people who come across your work and want to stay in touch.